PFLAG Olympia – Local chapter of the nation's foremost family-based organization committed to the civil rights of gays, lesbians, bisexual and transgender persons. PFLAG-Olympia is the local chapter of the nation’s foremost family-based organization is committed to the civil rights of gays, lesbians, bisexual and transgender persons. Advocacy to end discrimination and to secure equal civil rights. Proud People: to make sure that all people who are lesbian, gay, bisexual, transgender, and queer are not only valued by society, but take pride in and value themselves. Loving Families: supporting thousands of families across the country and around the world. Safe Communities: People who are LGBTQ and their families deserve to be safe and secure, no matter where they live, work, study, pray or play. Through our mission of support, education, and advocacy, PFLAG works to make sure that all communities provide this type of security, and have the resources needed to help those communities thrive. Diverse and Inclusive World: where difference is celebrated, and all people are valued inclusive of their sexual orientation, gender identity, and gender expression. New PFLAG-Olympia shirts and hoodies here. PFLAG is the extended family of the LGBTQ community. We’re made up of LGBTQ individuals, family members and allies. Because together, we’re stronger. Our Vision — We celebrate diversity and envision a society that embraces everyone, including those of diverse sexual orientations and gender identities. Only with respect, dignity and equality for all will we reach our full potential as human beings, individually and collectively. PFLAG welcomes the participation and support of all who share in, and hope to realize this vision. We are a community of and welcome LGBTIQQTSA* persons of all ages. LGBTIQQTSA* = lesbian, gay, bisexual, transgender, intersex, queer, questioning, two-spirit, and ally. PFLAG-Olympia welcomes all allies – straight and GLBTQ. 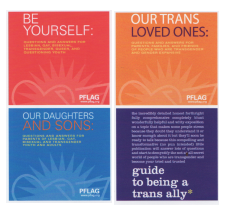 Download great free publications from PFLAG National here. 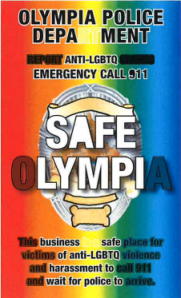 Learn about the Olympia Police Department’s Safe Olympia Initiative to reduce hate crimes against our lesbian, gay, transgender and questioning visitors and residents.